The Sunday Telegraph leads with calls from the Prime Minister that Britain must be ready to fight terrorist groups anywhere in the world, as the Government draws up plans to defeat jihadist forces inside Libya. Ahead of his trip to South East Asia, the Prime Minister has argued that ISIL will only be thwarted if countries unite against 'one of the biggest threats our world has faced', and he has ordered officials to begin planning for a new intervention in Libya, which has become a haven for ISIL jihadists. The Mail on Sunday reports a secret plan for the mass deployment of armed troops on the streets of Britain in the wake of a major terrorist attack. It claims that more than 5,000 heavily-armed soldiers would be sent to inner cities if ISIL or other fanatics launched multiple attacks on British soil, in an unprecedented military response to terrorism. Our position is that the MOD works closely with other government departments and agencies to ensure that it is able to provide appropriate assistance in response to any security threats, including national security. Contingency planning is under constant review. The Sunday Times also alleges that Britain's Special Forces are facing the worst manpower crisis in their 75-year history. Details were said to have emerged in the last fortnight after the PM said he wanted to spend more of the defence budget on the Special Forces, spy planes and drones to combat the threat of Isil terrorists. The MOD’s position is that we do not comment on Special Forces. The Sun on Sunday carries a short article claiming that one in five soldiers are unfit for frontline duties, while The People writes that sick leave is causing strain in the Royal Navy as the service struggles to find specialists. However, we’re clear that we can and do meet our operational commitments right around the world. The reality is that around 90 per cent of UK armed forces were able to deploy over the time period in question. In some cases, there may be minor medical limitations that would exclude them from the most gruelling missions. The Royal Navy is committed to a range of innovative measures designed to address challenges in recruiting and retaining engineering and technical expertise in a competitive market, and these measures are already producing results. 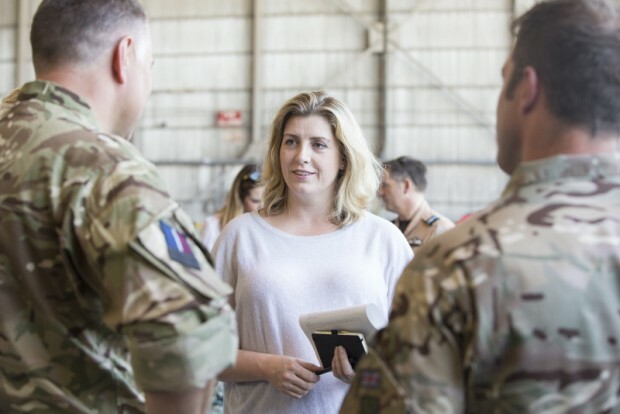 Penny Mordaunt at RAF Akrotiri, Cyprus, meets RAF personnel helping to tackle the ISIL threat.